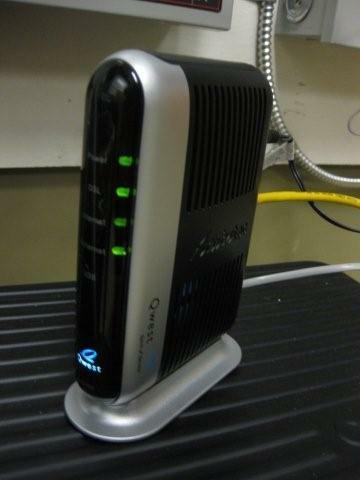 I did a DSL installation today of a Qwest DSL line in downtown Portland. I have to say that I am pleasantly impressed with the quality of the DSL service, with the Actiontec M1000 modem, and with the Qwest tech who installed the service. If you are in downtown Portland and need Internet access for a small business (or as in my case a guest network, etc…) it is hard to go wrong (the price is certainly right at $74.25/mo for 7 megabit). I am surprised (more like shocked) that they do not have the 20 megabit service available to offer me in downtown Portland. I am served out of the PTLDOR69 Qwest CO which is *the* downtown Central Office. My building could literally fall over and land on the CO (I think I have more vertical feet of cable than I do horizontal distance in the road). Traditionally, Qwest has deployed their DSL service with DSLAM racks that are attached to their ATM cloud. You are then connected across that ATM cloud to an access concentrator at your ISP (in my case, Qwest is my ISP). This is actually quite cool as there are a lot of different providers that you can go with (some with special features like content filtering, etc…), though, if your just looking for Internet access, it is hard to beat Qwest for speed and quality of their network. Depending on who your ISP is, there are a number of different ways you might have to configure the DSL modem, though with Qwest’s internet service you historically have used “PPPoA” (Point to Point Protocol over ATM). What I noticed about this installation that differs from previous installations is that they now by default configure your modem for “PPPoE” (Point to Point Protocol over Ethernet) when you go through the “Quick Setup”. This makes me wonder if their new DSLAM racks that support the ADSL2+ (20 megabit) speeds no longer use ATM as their backend transport and as such require PPPoE instead of PPPoA. This to me is a bit disappointing as when you utilize PPPoE your maximum packet size is cut down to 1492 bytes instead of your standard 1500 bytes, due to the PPP overhead. There are certain circumstances in which having reduced MTU capability can bite you (i.e. PMTU discovery fails). The good news is that they still seem to support PPPoA (at least on the DSLAM I am attached to). I went ahead and set my modem to PPPoA and all was good. 1500 byte frames work perfectly. It is possibly that there is some specific reason they want you to use PPPoE over PPPoA, but until I have issues or learn something new, I am sticking with PPPoA. My ping times to my first hop gateway averaged 37ms which is excellent for a DSL line. DSL lines introduce latency intentionally in order to avoid bursts of interference. By spreading the datastream over time it is more likely to be able to recover from bit errors. Compare that with 4ms round trip to my first hop on Verizon FiOS and 105ms round trip to my office Internet router on ClearWire (let’s say 70ms of that is to the first hop since I could not run a traceroute sucessfully to determine what my first hop was on Clear). I am also happy to report that Qwest has no trouble issuing you a static IP (or a subnet of static IP’s), and even has a fully automated online system with which to do this. You can only request static IP’s once the line is installed, but it is fast and pretty painless. You just need to know the username and password that the modem uses to “dial up” to the Internet when it connects so that you can login to the qwest.net control panel. It is even possible to set custom reverse DNS entries (which is necessary if you want to run a mail server on the connection). You do have to pay for the static IP’s (the rate varies depending on how many you need) and there is a one time setup fee as well (which is kind of lame considering the process is fully automated). It is worth noting that if you get a single static IP, it just simply set’s Qwests access concentrator to always assign your modem the same IP address (no modem re-configuration required). You can then map ports though to servers on the inside to make use of that static IP, or you can set your modem to bridging mode and run PPPoE on some device (server or another router/NAT device). If you get a block of static IP’s, the modem still does PPPoA/PPPoE to the Qwest network, though it runs the PPP session in “un-numbered” mode and binds a real Internet IP to the LAN side of the modem. 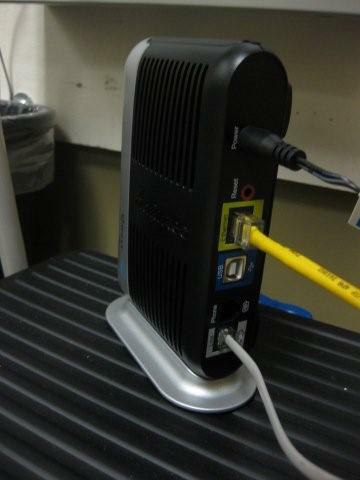 The modem must be set into routing mode in this case. My modem (the Actiontec M1000) came with firmware version QA02-3.60.3.0.8.2-M1000 which was not the latest version. Since the device was brand new I wanted to start out with the latest-and-greatest so I upgraded to QA02.5-3.60.3.0.8.6-M1000 (available on www.qwest.net since it runs custom Qwest firmware). Kudos to Actiontec and Qwest to a very smooth upgrade process (the utility is really simple, though I guess I would prefer just a web form on the admin page). I should also mention that the admin interface of this modem is very nice looking and extremely fast for being an embedded device. It is also worth noting that there are some very cool things you could do with DSL lines attached to the Qwest ATM cloud. Say you are a company that needs moderate speed WAN connectivity to a lot of remote locations (say for retail POS applications or for Citrix). You could plug a couple T-1’s (or a fractional DS-3) into the Qwest ATM cloud in Portland, and then turn up DSL lines all over the LATA for very small per-site costs (this is what they call their MegaHost product). A 256k DSL line is as low as $25/mo if I remember correctly (or even $15 a month in a residence)! To test your Qwest DSL line the best speedtest is going to be one residing on Qwests network: http://speedtest.qwest.net I find the speedtests from DSLReports and others to be frequently too busy to give an accurate reading. The bottom line is that Qwest has done an excellent job making their DSL service shine (since I suppose they don’t have the money to do fiber like Verizon). I find it funny that they advertise it as Fiber Optic Internet (when really it is just fiber to the node a.k.a. DSLAM rack). They don’t even call it DSL anymore due to all the negative PR around DSL (thanks Comcast). I am getting a full 7 megabit at my office, though it might be disappointing if you are a long way from the CO, are in an old neighborhood with poor quality cable, or if you are provisioned off a remote DSLAM rack that has slow backhaul links to the CO.
PPPoE comes in handy when you want to just order the single IP but use it on your firewall instead of using NAT on the DSL modem. Most firewalls support PPPoE, so you configure the M1000 in transparent bridging mode then configured the external interface of your firewall for PPPoE, enter your qwest.net username and password, and now you have a public IP on your firewall. I just set up an old Cisco Pix 501 this way on a qwest.net DSL line and the Actiontec M1000 today, with just that configuration. An excellent point. If you want to use something else to do your NAT (like the Pix 501 mentioned or an ASA) PPPoE can be a good way to go. Of course you are still stuck with the 1492 MTU size limit that way. I just set one up in routing mode with a block of static IP’s so I could assign my PIX 515e a real Internet IP but still use 1500 byte MTU’s and not have to use the M1000 NAT. I’ve had Qwest DSL in my house for 6 years and other than some basic maintenance that either my ISP or Qwest has done, it’s been a solid connection. Downside is that they STILL haven’t updated the remote terminal with a DSLAM so I am stuck at the limiting distance where I can’t get more than 1.5 down and 800 up. Clear isn’t much of a savings nor are they really any faster than my DSL so that’s not much of a faster solution for me. I could get Comcast, but I really don’t like them. My ISP (SpiritOne) gives me a static IP, doesn’t block any ports and generally has good support. Until Qwest gets fiber out here and installs a remote DSLAM closer to my house, I am stuck with what I have. Yeah, you might want to consider checking Clear out if you are otherwise against Comcast. I got to test out a friends Clear service a while back and it actually was the speed advertised (would be faster than your 1.5 meg DSL). You certainly would not get the static IP, or even the ability to use your own NAT (which is a bummer), but if you are looking at basic consumer Internet it may fit the bill. I am curious how ISP’s that sell Qwest DSL with their own IP upstream (like what you have) can compete. You can get the same service now from Qwest (even with static IP’s and such) for seemingly less than what these other ISP’s charge. I actually have been pretty impressed with the Qwest DSL support. My Qwest DSL costs me $21 a month for the line and my ISP charges me $17 a month for a total of $38 a month. I’ve been with SpiritOne for over 7 years and have been pleased with their service and outstanding up time over these past years. Since I do many things off my DSL, (DNS, Web, Mail, etc), I am beyond the standard “consumer” grade broadband of just surfing and such. I’ve been thinking of contacting Qwest to see how much their TCO would be compared to what I have now if they would be willing to redesign the DSL circuit to support a bigger pipe. I don’t think that is going to happen. Yeah, that’s a pretty good price. Qwest has promotions running on their DSL service at I believe $15 a month for 1.5 meg for 12 months, but static IP’s would be extra. It might be worth asking how high a speed circuit they could provision you now (with newer chipsets in the DSLAM’s and modems). It is possible that since the last time you ordered service that they put in a new DSLAM at your node sitting right next to the one you are currently off. Do you have any concept for where your DSLAM is? Which CO are you out of? It is also worth noting (as I am sure you know) that if you get service from SpiritOne or Qwest you are still being served off the same DSLAM and backhaul from that DSLAM to Qwest’s ATM cloud. The service differentiators for a third party ISP are: 1. Customer Service, 2. Extra features (like static IP’s), 3. Quality of upstream ISP’s and if they run over-subscribed on their ISP’s, 4. If their PPPoA concentrators are over-subscribed and dropping packets at certain times of day. #4 above is a little-known item to many people. When your circuit is terminated at your ISP across Qwest’s ATM cloud it probably comes in a DS-3 to your ISP’s router/concentrator. If you have a bunch of 7 meg DSL lines on the same DS-3 it does not take too many to cause packet loss. I am working with my vendor and Qwest technical support to do exactly the setup that you mention. Put the M1000 in transparent bridging mode and put the PPPoE configuration in PIX 501. Did you have any gotchas when you configured yours. In router mode the firewall works fine, but not in transparent bridge mode. Qwest does not even see PPPoE request being sent. I had qwest service but then moved and it’s not available in this area. Is there a way I can configure my m1000 modem to work on verizon’s service? In other words what are the settings I need to change the m1000 to and where do I find what those settings are on verizons network? Why is a reverse dns entry required to run a mail server? Are you talking about internal private network dns entries (for internal servers)? or are you talking about reverse dns for my public domain name? I have new 12 MBps Qwest DSL running through ActionTec pk5000 with ports 25 and 443 forwarded to my internal Ms Exchange Edge and Mail OWA servers respectively… I know the 443 port forwading works because I can get to the OWA web page from outside.. But no mail I send to myself (like from GMail), is reaching the Exchange server… Is this because of not having reverse dns set up properly somewhere? Hmm, what you describe should not be impacted by having a reverse DNS entry or not. The type of reverse entry I am referring to is a real in-addr.arpa entry (i.e. 1.2.2.4.in-addr.arpa. for 4.2.2.1 as an example) out on the open internet (not an internal network thing). The reason a reverse DNS entry is required is for outbound mail to certain domains. I believe Comcast and AOL are two of the prime offenders that require some kind of reverse DNS entry to exist for a host that sends them mail or else they will bounce it (or refuse to accept it). For inbound mail to work you need an “MX” record pointed at an “A” record that points to your IP address. P.S. Its worth noting that a lot of ISP’s block port 25, so perhaps your getting caught up in that? If you have another host you can login to somewhere else on the internet go to a shell prompt and type “telnet 25″. If the screen clears and you get a black screen then a TCP connection worked. If it fails to connect then perhaps Qwest is blocking port 25, or your router is not forwarding the connection properly. Great and thorough article… I dont know that I ever see such detail in articles any more. My comment is that the only downside I have with DSL is the uplaod speeds. It’s very unfortunate that they can’t seem to increaes that. It is for that reason that most of my customers go with cable services now. Yeah, so Qwest is now offering ADSL2+ which offers higher download speeds (but same crummy upload speeds) and in some areas, they are offering VDSL which has a much better upload speed along with very high download speeds. I have this, it’s incredibly fast!